I have to hold my hands up and admit I'm the worst person at eating breakfast. When I head to work in the morning I never eat breakfast. It's just too early for me and I can't face it. Somewhere between 9 am and 10 am is my optimum time to eat and enjoy breakfast. Before that? Nope! Not going to happen. I have to say in my house it's do what I say and not what I do, so Cooper never leaves the house without a tummy full of breakfast, which is usually a hearty bowl of porridge. I do eat breakfast on my days off, when I will quite often enjoy a bowl of porridge. I'm not a great fan of cereal. Now and again I will take a notion for it, but not very often. I quite like a toasted bagel with cream cheese or a toasted teacake, the occasional slice of toast or an blueberry oaty breakfast bar. On a Sunday we eat breakfast late and we all enjoy baked beans on toast or a full cooked veggie breakfast. Do you eat a special breakfast on Sundays? 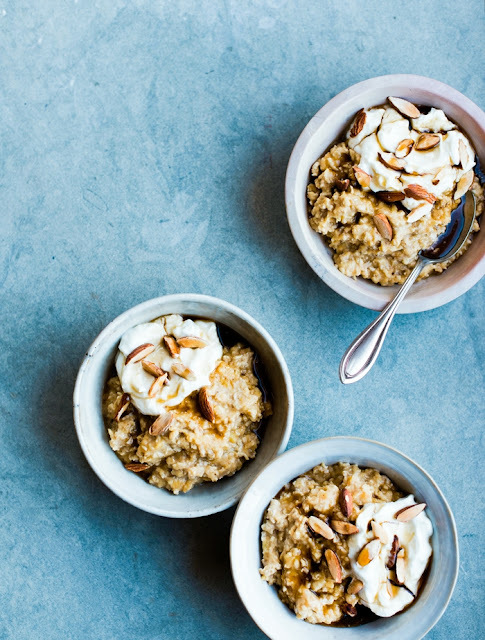 Why is porridge so good for you? Oats have a low glycemic index, so you don't experience that sugar spike with them. They leave you feeling fuller for longer and one bowl of porridge has more fibre than a slice of wholemeal bread. It's also rich in minerals including iron, copper and manganese. The fibre in porridge turns jelly-like in your stomach which is why it leaves you feeling fuller for longer and it is said to help lower cholesterol, prevent heart disease and lower the chance of some cancers. You are also less likely to snack or have that late morning slump. A bowl of porridge should happily keep you going until lunchtime. My dad is a true Scot. He makes his porridge the traditional way with water and a pinch of salt. To hell with that I say! I make Cooper's porridge with milk, raisins, cinnamon and flax seeds (linseeds), then mix in a mashed banana for sweetness. For the adults I make the porridge with coconut milk (fresh drinking coconut milk, not the thick stuff in tins you use in desserts), which is Graham's favourite, blueberries and cinnamon then mixed in mashed banana and topped with dessicated coconut and more blueberries. I finished the porridge with a small drizzle of maple syrup, but that is optional. The mashed banana adds a lot of sweetness to the porridge, so you don't really need the maple syrup. How to pimp your porridge? Add mashed banana and slices of strawberries for a summer hit. For a chocolatey porridge, mix in a little cocoa or cacao powder and top with sliced bananas. Make porridge more interesting. Cook it with raisins and when it's ready, stir in mashed banana and top with a spoonful of crunchy granola or muesli. Top with a spoonful of dessicated coconut and slices of ripe mango for a tropical taste. For a dessert style porridge top with slices of ripe pear (cooked or tinned) and a generous grating of dark chocolate. For apple pie porridge, stir in cooked apple and top with a sprinkle of cinnamon and a some crumbled ginger snap (biscuit/cookie). Mix in a dollop of peanut butter (add extra milk as this will thicken it) and top with curls of dark chocolate. Top with tinned peaches, raspberries and a dollop of plain yogurt (dairy or dairy-free) to make peach melba porridge. For a treat, mix a generous dollop of nutella through your porridge and top with slices of ripe strawberries. For a nursery style porridge, top your porridge with a big dollop of your favourite jam. 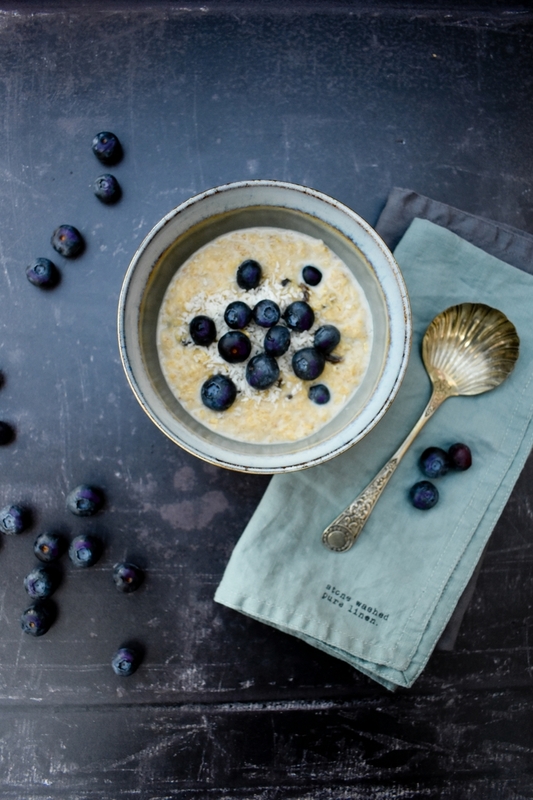 Add your oats, milk, cinnamon and most of the blueberries to your pan (reserve a few to top the porridge with before you serve) and cook gently for a few minutes until it thickens, stirring it regularly. 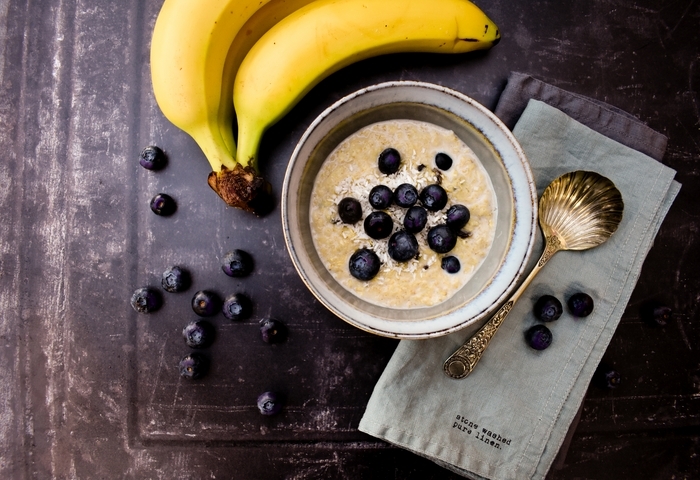 While your porridge is cooking, mash a banana in your porridge bowl until it becomes a puree. 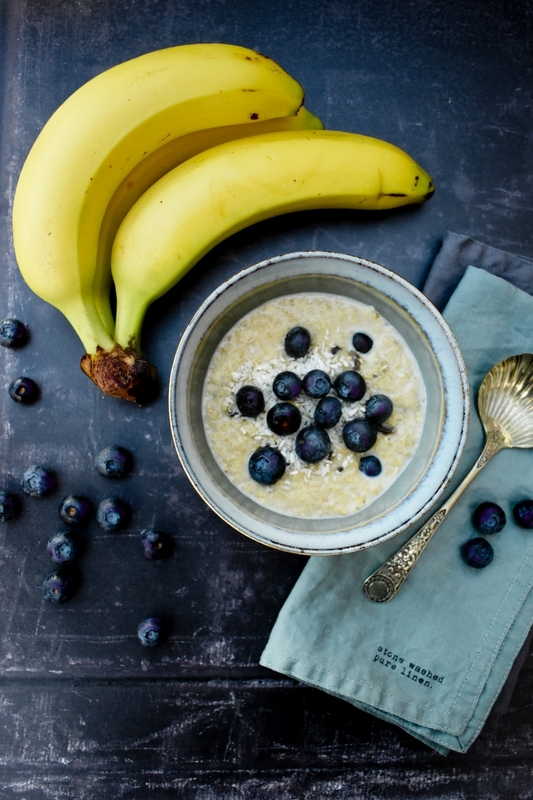 Pour your porridge into your bowl and mix in the banana with a spoon. Top with coconut and more blueberries. If you are a fan of oats, try these overnight sweet potato oats. I'll be very happy to pimp my porridge like this ay day. Looks sand sounds so good! The cooked oats are porridge and the oats can be called oatmeal. I suppose language changed when people moved to America. Pancakes on a Sunday are ideal. I am glad it's not just me then and no to salt from me. Oh yes they work so well together. Wow, thanks for sharing this recipe, I do love porridge. I'm game for any cozy porridge in the morning! As you know, I'm not a fan of breakfast, especially sweet breakfasts but porridge for supper is totally a thing in my house! I don't like it with milk though, so I use apple juice instead, which negates the need for added sweeteners. I also add slivered almonds and sultanas as it's cooking. It's perfect! I don't get the supper thing. Is it another meal after dinner or a late dinner? It's always been a mystery to me. Using apple juice is a good idea and yes do try the cinnamon. 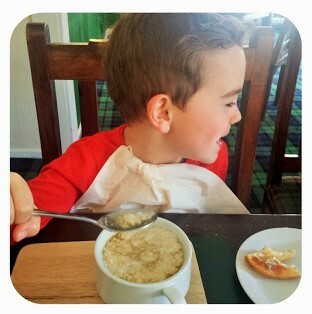 My family are big fans of Scottish oats and we eat them every day for breakfast (and sometimes for supper too!) On weekdays, we have overnight oats or simply soak them for a minute or two in milk before we dive in. We add cocoa to make them chocolatey, then lots of toppings - ground linseed, chopped walnuts, almonds, pumpkin seeds, dried fruits and fresh/frozen berries. Delicious! I've not tried overnight oats with chocolate. I must give that a go, although it will seem weird eating porridge cold. Oh good idea, I should do that too. Yes it was super tasty!